Enjoy old-fashioned hometown hospitality at our Baymont Inn & Suites Atlantic City Madison Hotel. Our modern hotel in Atlantic City provides free continental breakfast, free Wi-Fi Internet access and a friendly smile at the front desk. We are near the Atlantic City Boardwalk, the Atlantic City Convention Center, and just 14 miles from Atlantic City International Airport. Walk to the beach or try your luck at casinos nearby.We proudly offer onsite parking for a nominal charge: park your car, trailer or RV here. Our hotel offers a guest laundry facility as well as a computer terminal with copy machine and fax. Your well-appointed guest room will provide every comfort: from guest controlled heating/cooling, to work desk, reclining chair, coffeemaker, iron/ironing board and a flat HDTV screen. 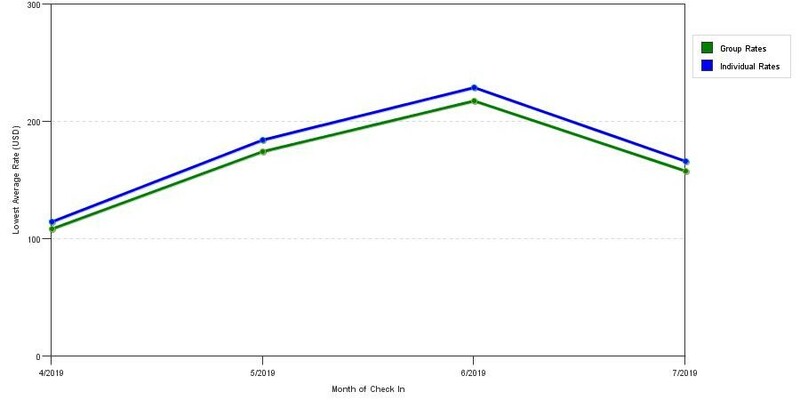 The graph above is fluctuations of room rates for both our group rates and the lowest online individual prices our rate checker could find at the time the group offer was placed. The best group/meeting rate displayed is 6.0% in the month of December 2019 and the highest average individual rate is $236 in the month of August 2019. This chart will show past seasonality and also project future months. If you are flexible with dates, you may want to consider staying at Baymont by Wyndham Atlantic City Madison Hotel in a month when rates are lower.